A spokesman for Gov. of California Arnold Schwarzenegger said Sunday that the governor would not apologize for calling lawmakers "girlie men," despite criticisms from US Democrats that the remark was sexist and homophobic. Schwarzenegger dished out the insult at a rally Saturday as he claimed Democrats were delaying the budget by catering to special interests. "If they don't have the guts to come up here in front of you and say, 'I don't want to represent you, I want to represent those special interests, the unions, the trial lawyers ... if they don't have the guts, I call them girlie men," Schwarzenegger said to the cheering crowd at a mall food court in Ontario. The governor lifted the term from a long-running "Saturday Night Live" skit in which two pompous, Schwarzenegger-worshipping weightlifters repeatedly use it to mock those who don't meet their standards of physical perfection. 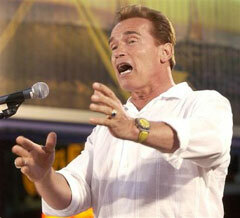 Democrats said Schwarzenegger's remarks were insulting to women and gays and distracted from budget negotiations. State Sen. Sheila Kuehl said the governor had resorted to "blatant homophobia." "It uses an image that is associated with gay men in an insulting way, and it was supposed to be an insult. That's very troubling that he would use such a homophobic way of trying to put down legislative leadership," said Kuehl, one of five members of the Legislature's five-member Lesbian, Gay, Bisexual and Transgender Caucus. "It's ironic that the governor would try to find a metaphor for weakness when his real problem is that we're being too strong," she added. Schwarzenegger's criticism of Democrats stems in part from their support of one bill prohibiting schools from contracting services with private companies, and another giving workers authority to sue their employers to enforce labor laws. Each side accuses the other of caving in to special interests. At a rally Sunday in Stockton, the governor gave a speech almost identical to the one he delivered in Ontario but without the "girlie men" remark. Spokesman Rob Stutzman said the line was dropped because Schwarzenegger had already sent the message he wanted to send, not because he regretted his remarks. "It's a forceful way of making the point to regular Californians that legislators are wimps when they let special interests push them around," Stutzman said. "If they complain too much about this, I guess they're making the governor's point." Assembly Speaker Fabian Nunez, a Democrat, said that while he wasn't upset by the remark, his 13-year-old daughter was. "She's a young girl who knows the governor and really likes him a lot and didn't find the term to be a positive term, and finds it to be derogatory," Nunez said. "It was no question a very, very insensitive comment to make. I personally am not intimidated or threatened by it, but I think it really is beneath Gov. Schwarzenegger." Will Saddam Hussein get a fair trial?